I've just returned from the very remote Tien Shan mountains - a fantastic and place of high mountains. We landed in Kazakstan (a country the size of west Europe) and were whisked from the airport for the long drive to Karakol in Kyrgystan. The countryside is amazing; people live in summer yurts in the high mountains with herds of sheep, horses and cattle. Some take trailers loaded up with beehives into the mountains for the pollen in the high alpine meadows. At Karakol we organized food lists and 11 clients, without any local language skills, bought 400 chocolate bars (I have a sweet tooth but that's crazy!) hundreds of loaves, eggs, cheese etc to sustain us for the coming weeks. Meanwhile Sean and I arranged camp kit, transport and accommodation. After checking stoves and packing we loaded up the truck for the next part of the journey, driving over passes up to almost 4,000 meters, to an ex-Soviet helicopter base. The helicopter deposited us rapidly onto the glacier at 3,800 meters. With the nearest people 3 days walk away we rapidly erected our tents and cook tent and got settled in. After acclimatization and practicing on local ice cliffs we made an ascent of a peak (unclimbed?) at almost 5,000mtrs. Over the next week attempts were made on other peaks but deep snow and avalanches thwarted us. The helicopter flew in 2 hours early and it was a mad rush to get the last tent down and load up whilst being battered by the rotors’ downdraft but we were quickly in the air and heading for Khan Tengri base camp where Sean and 8 clients were going to make an attempt on that peak (thwarted again by bad weather) whilst I returned to UK with 3 clients. A fantastic country, weather was too warm with the coldest night in my tent being -4 degrees (boiling in my altitude sleeping bag). The weather was a problem and we could literally see the glacier melting away from under our tents. We varied from a truck driver to an investment banker, a doctor to a construction manager, and from 19 to 50 years old. A wonderful team with broad experience, sadly the weather was too warm (or good?) for what we wanted to achieve this time. Maybe another time, who knows? Summer arrived in the UK (just after I returned from Asia) and after a few days climbing in the Lakes I was off to Snowdonia with Matt & Neil. On Saturday we practiced a "recoverable abseil" using an Italian hitch, and then ascended a grade III scramble up the steep East face of Tryfan and Matt jumped the gap between the 2 pinnicles of Adam & Eve, all in fantastic sunny weather. Sunday started bright and we were the first on Idwal Slabs and climbed Ordinary Route, then scrambled up Seniors Ridge until we could cross Nameless Cwm to climb Cneifion Arete. We were 50mtrs up Cneifion when the sky darkened, thunder was heard and soon we were in a hail shower. Neil and Matt are set on scrambling on the Cuillins this year and a better introduction to the changeable weather of Skye could not have been arranged! A superb couple of days full of laughs and experiences, and we were dry by the time we got back to the car. A superb few days personal climbing on Ben Nevis, sleeping in the CIC hut. Great weather, great partners, and so much good food (carried in) that we were giving passing climbers warm garlic bread, and feeding nearby campers with haggis or fresh pasta to help use it up. Sadly there were lots of rescues going on around us with the RAF helicopter flying in every day looking for lost walkers, and slow or overdue climbers. Whilst on Ben Nevis, next to the Trig Point, we were asked by another group to help with the working of a GPS which they'd programmed the night before. We explained that we were on the summit of Ben Nevis. Fortunatelly the visibilty lifted and the journey down into the valley was made more straight forward. 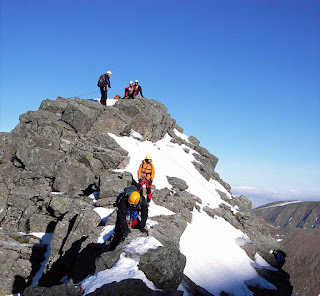 Tower Ridge on Ben Nevis is a wonderful scramble in summer but a greater undertaking in winter. Paul, Pat and I left the car park in the dark at 6am aiming to be at the start of the ridge as the sun rose but still there were head torches from another party flashing ahead of us. Conditions were fantastic, if a bit lean, and the temperature inversion with the cloud below us was fantastic. It was one of those all days when you wish you'd remembered your sunglasses.